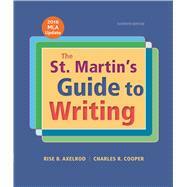 by Axelrod, Rise B.; Cooper, Charles R.
Whether you have years of experience as a teacher or are new to the classroom, you and your students can count on The St. Martin’s Guide to Writing to provide the support you need in first-year composition, with a rhetoric, an array of engaging readings, a research manual, and a handbook, all in a single book — and available online. Thousands of instructors and their students rely on the Guide’s proven approach because it works: the Guide’s acclaimed step-by-step writing guides to 9 different genres offer sure-fire invention strategies to get students started, sentence strategies to get students writing, and thoughtful revision strategies to help students make their writing their own, no matter what their major. With its hands-on activities for reading like a writer and working with sources, there is no better text to help students bridge reading analytically to successful writing in first-year composition and beyond. In keeping with the Guide’s tradition of innovation and based on instructor feedback about what assignments they give their students, the new edition integrates new types of writing that reflect the range of genres being assigned in first-year composition, including a reimagined Chapter 5 that provides a bridge from personal and expository to argumentative writing by following a scaffolded approach. The eleventh edition is available with LaunchPad for The St. Martin’s Guide to Writing, an online course space of pre-built units featuring the full e-book, tutorials, and adaptive LearningCurve activities to help students hone their understanding of reading and writing. To order or purchase the print text with LaunchPad, use ISBN 9781457698484 for the Cloth-bound version, ISBN 9781319016036 for the Paper-bound version, or ISBN 9781319016067 for the Short Edition. Rise B. Axelrod is McSweeney Professor of Rhetoric and Teaching Excellence, Emeritus, at the University of California, Riverside, where she was also director of English Composition. She has previously been professor of English at California State University, San Bernardino; director of the College Expository Program at the University of Colorado, Boulder; and assistant director of the Third College (now Thurgood Marshall College) Composition Program at the University of California, San Diego. She is the co-author, with Charles R. Cooper, of the best-selling textbook The St. Martin's Guide to Writing as well as The Concise Guide to Writing and Reading Critically, Writing Well. Charles R. Cooper is an emeritus professor at the University of California, San Diego. He served as coordinator of the Third College (now Thurgood Marshall College) Composition Program at the University of California, San Diego, and co-director of the San Diego Writing Project, one of the National Writing Project Centers. He advised the National Assessment of Educational Progress—Writing (1973-1981) and coordinated the development of California's first statewide writing assessment (1986-1991). He taught at the University of California, Riverside; the State University of New York at Buffalo; and the University of California, San Diego. He is co-editor, with Lee Odell, of Evaluating Writing and Research on Composing: Points of Departure, and he is co-author, with Rise Axelrod, of the best-selling textbook The St. Martin's Guide to Writing as well as The Concise Guide to Writing and Reading Critically, Writing Well. Assess the genre’s basic features. Choose an event to write about. Organize your story to enhance the drama. Use dialogue to portray people and dramatize relationships. Choose a subject to profile. Determine your role in the profile. Develop your perspective on the subject. Determine the writer’s purpose and audience. John Tierney, Do You Suffer from Decision Fatique? Susan Cain, Shyness: Evolutionary Tactic? Choose a broad concept to write about. Conduct initial research on the concept. Find an engaging focus and angle on the concept. Conduct further research on your focused concept. Create an outline that will organize your concept explanation effectively for your readers. Consider the explanatory strategies you should use. Use summaries, paraphrases, and quotations from sources to support your points. Use visuals or multimedia illustrations to enhance your explanation. Use appositives to integrate sources. Use descriptive verbs in signal phrases to introduce information from sources. Assess the genres’ basic features. Choose a controversial topic to write about. Conduct research to find sources. Summarize sources and annotate your working bibliography. Add a commentary to your annotated bibliography. Choose opposing argument essays to analyze. Brainstorm subtopics for a report. Synthesize sources for a report or analysis. Analyze and compare the opposing argument essays. Draft a working thesis statement for your report or analysis. Create an outline to organize your report or analysis effectively for your readers. Develop your report or analysis. Draft your report or analysis. Choose a controversial issue on which to take a position. Frame the issue for your readers. Formulate a working thesis stating your position. Develop the reasons supporting your position. Use sources to reinforce your credibility. Identify and respond to your readers’ likely reasons and objections. Create an outline that will organize your argument effectively for your readers. Choose a problem for which you can propose a solution. Frame the problem for your readers. Use statistics to establish the problem’s existence and seriousness. Assess how the problem has been framed, and reframe it for your readers. Develop a response to objections and alternative solutions. Create an outline that will organize your proposal effectively for your readers. Choose a subject to evaluate. Assess your subject and consider how to present it to your readers. Formulate a working thesis stating your overall judgment. Develop the reasons and evidence supporting your judgment. Respond to a likely objection or alternative judgment. Organize your draft to appeal to your readers. Choose a subject to analyze. Present the subject to your readers. Analyze possible causes and effects. Cite a variety of sources to support your causal analysis. Formulate a working thesis stating your preferred cause(s) or effect(s). Draft a response to objections readers are likely to raise. Draft a response to the causes or effects your readers are likely to favor. Create an outline that will organize your causal argument effectively for your readers. Find a story to write about. Provide support for your argument. To build on your support, consider doing outside research. Create an outline that will organize your argument effectively. Use the five elements of dramatizing. Freewrite for a set amount of time. Test for consistency and completeness. Use thesis statements to announce the main idea. Use forecasting statements to preview topics. Paragraph indents signal related ideas. Topic sentences announce the paragraph’s focus. Pronouns connect phrases or sentences. Repetition of sentence structure emphasizes connections. Collocation creates networks of meaning. Transitions can indicate a sequence in time. Transitions can indicate relationships in space. Headings indicate sections and levels. Headings are not common in all genres. At least two headings are needed at each level. Use calendar and clock time to create a sequence of events. Use temporal transitions to establish an action sequence. Use verb tense to place actions in time. Use action sequences for vivid narration. Use dialogue to dramatize events. Use process narratives to explain. Use process narratives to instruct. Use clear and precise wording. Use representative examples for support. Use up-to-date, relevant, and accurate statistics. Cite reputable authorities on relevant topics. Narrow (or expand) your results. Find books (and other sources). Find government documents and statistical information. Find Web sites and interactive sources. Is the source scholarly, popular, or for a trade group? How is the source written? What does and does not need to be acknowledged. Avoid plagiarism by acknowledging sources and quoting, paraphrasing, and summarizing carefully. Decide whether to quote, paraphrase, or summarize. Copy quotations exactly, or use italics, ellipses, and brackets to indicate changes. Use in-text or block quotations. Use punctuation to integrate quotations into your writing. Summaries should present the source’s main ideas in a balanced and readable way. Format your list of works cited. Cite all sources, regardless of medium. Reflect on your work and what you have learned. Use headings to organize your writing. Use lists to highlight steps or key points. Use white space to make text readable. Number, title, and label visuals. Integrate the visual into the text. Use common sense when creating visuals on a computer. Understand the kind of presentation you have been asked to give. Assess your audience and purpose. Determine how much information you can present in the allotted time. Use cues to orient listeners. Prepare effective and appropriate multimedia aides. Verify that you will have the correct equipment and supplies.